Doctor Who has received three nominations in this years BAFTA Cymru Film, Television and interactive Media Awards. Doctor Who has been recognised with three nominations for this year’s BAFTA Cymru Film, Television and Interactive Media Awards. The prestigious nominations came in the categories of Television Drama and Sound with the Adventure Game, Doctor Who: The Gunpowder Plot nominated in the Digital Creativity and Games section. And we’re delighted that The Sarah Jane Adventures has been nominated in the Children’s Programme category. 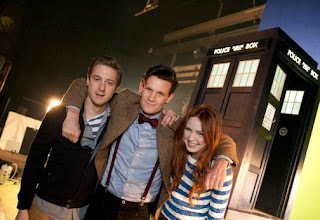 The winners will be announced at the BAFTA Cymru Awards on Sunday, 30 September 2012 at the Wales Millennium Centre. Good luck to all our nominees! Find out why our most recent Adventure Game received a nomination and play The Gunpowder Plot now!"